If you asked a sampling of athletes what the damper setting on a rower does, you’d probably hear something along the lines of “It adjusts how hard it is to row,” or similar from the majority who answered. Many people confuse damper setting with intensity or difficulty level. While you will feel more resistance with a higher damper setting, it is not meant to be a difficulty setting. The intensity of your workout is actually controlled by you, by how hard you are pulling. 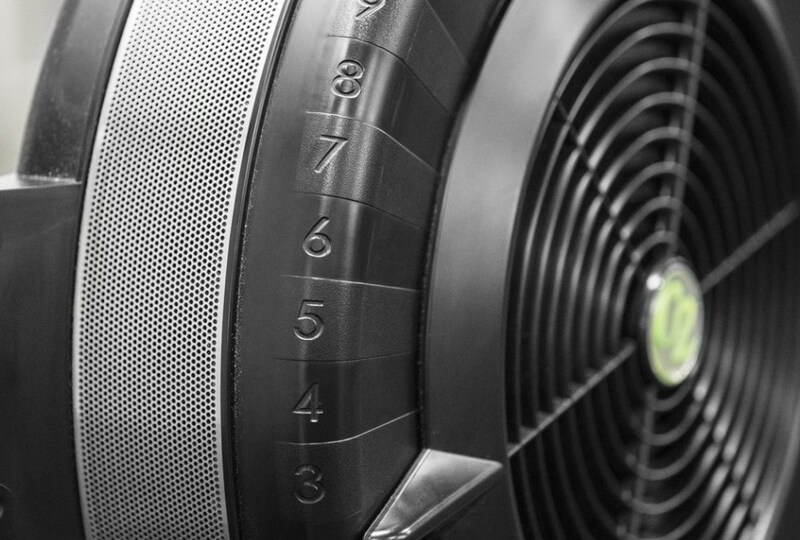 To understand the damper settings better, we need to take a look inside the rower. At the front of the rower is the fan mechanism. The handle is attached to a chain that drives gears that spin the flywheel made up of fan blades. The flywheel has a series of vents on the side that allow air to flow in and out. The damper is a curved piece of plastic that either restricts the flow of air to the fan blades on the lower damper settings, or opens up the flow of air on the higher damper settings. Damper fully closed at 1 setting. On a lower damper setting with the airflow closed off, the fan blades spin fast and freely due to less air resistance. 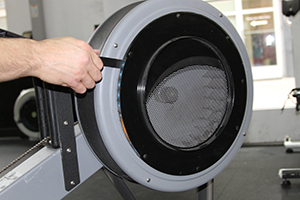 The flywheel takes less effort to start spinning, and it tends to spin longer before it slows down. With these lower settings, you need to pull fast and explode with your pulls to match the speed of the flywheel and generate efficient strokes. Otherwise, you are just wasting energy, as your pulls aren’t generating any force and you are, quite literally, just spinning your wheels. Damper fully open at 10 setting. On a high damper setting with the airflow fully open, the fan blades are slow to spin, feel sluggish, and they slow down faster due to the higher air resistance. The higher settings favor a slower pull. Interestingly, the higher damper settings are more suited for athletes new to rowing as the high air resistance lets the rower truly feel the row throughout the stroke. This slower pace allows athletes to concentrate on their technique, gradually moving on to lower damper settings as their speed and explosiveness improves. This video helps to explain the damper settings. The reason rowers have a range of damper settings is so they can mimic the feel of a real boat on the water. The lower settings approximate what a sleek racing boat feels like. The higher settings feel more like a clunky rowboat. The settings also allow athletes to train for speed or power. The ideal rowing athlete is a bit of a mix of strength and speed. To personally experience how the damper settings affect your times and speed you are able to pull, set the damper at 2, 4, 6, 8, and 10, and try to maintain the same stroke rate (24-30 strokes per minute) over a distance of 200 meters for each setting. You should get a good feel for what the settings do, and you may even discover what your sweet spot setting is. So where should you set the damper? Like most things, it depends. You need to consider the distance you are rowing and what your goal is. For sprints of short distances less than 500 meters, you may find a higher damper setting gets you a faster time. For longer distances, a lower setting will keep you from tiring too early. If you are looking for an aerobic workout, lower damper settings are what you want, and for a more strength-focused workout, set it at the higher damper settings. And, like everything we do in CrossFit, you want to vary the settings on the rower so you aren’t always pulling at the same damper setting. You should be experienced in rowing at a variety of damper settings.